In this tutorial we will discuss Java String trim() and hashCode() methods with the help of examples. It returns a String after removing leading and trailing white spaces from the input String. For e.g. " Hello".trim() would return the String "Hello". In the following example we have a string with leading and trailing white spaces, we are using trim() method to get rid of these leading and trailing white spaces but we want to retain the white spaces that are in between the words of the given string str. The trim() method only removes the leading and trailing white spaces and leaves the in between spaces as it is. 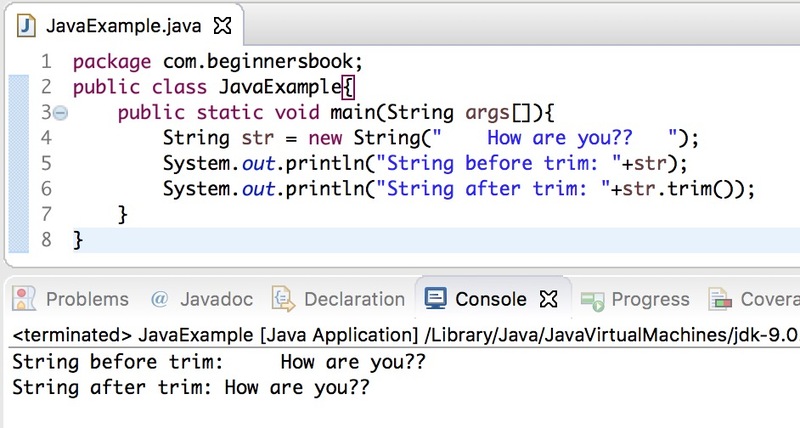 In the following example we have a string str with the value “Welcome! !”, we are displaying the hash code of this value using the hashCode() method.